Henry McLeod with the emu feather plumes. He never recovered from the shell shock and he was placed in a home at Mount Lofty, Toowoomba where he stayed until his death. Henry McLeod was born on 13 Sep 1893 near Longreach in Queensland.. He enlisted as reinforcement to the 5th Light Horse on 25 May 1915. He was shown as a butcher and was described as being 5 feet 11 inches tall, nearly 22 years of age, with dark complexion and brown eyes. It could not have been long before he was shipped overseas as on November 1915 he suffered mumps in Abbassia. 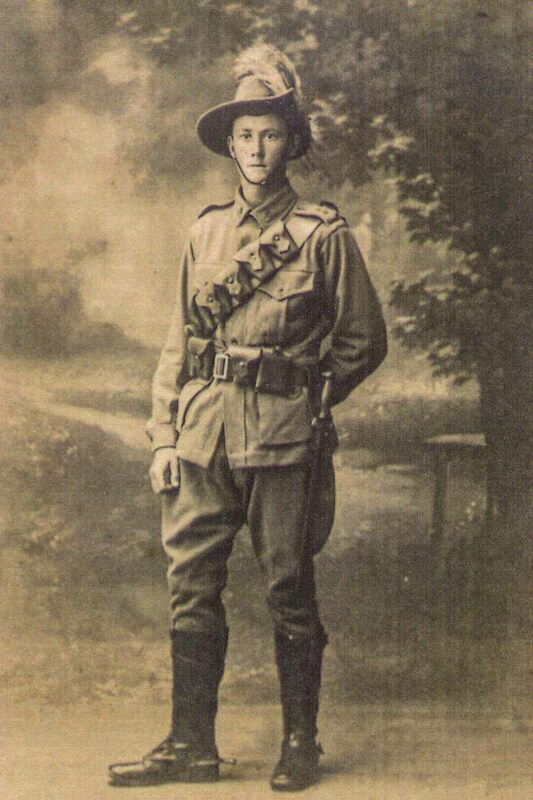 On 1 March 1916 he joined the 2nd Reserve Regiment in Maadi; transferred into the 13th Field Artillery Battalion on 6 April 1916; and in to the 5th DAC (Division Ammunition Column) on 5 May 1916 as a mustered driver at Ferry Post East. On 18 May he was posted to Number 1 Section. On 18 June 1916 he was ordered to join the British Empire Forces (BEF). He boarded the CC HMT Kinfaunscastle at Alexandria, Egypt, and disembarked on Marseilles on 29 June 1916. His active war service ended quickly in the battlefields of France. He was admitted to hospital in France on 21 August 1916. He was transferred to the French hospital barge “Jan Breydel” with “French Jaundice” later that month and left from Bonulogne, for the Horton County London War Hospital, in September 1916. He moved from the No 2 Communication Depot in December 1916 and then as a driver to the No 4 Depot, Warekam from Weymouth, in February of the following year. He returned to Australia in July 1917 with a disability and was discharged on 26 November of that year. Henry never recovered from the shell shock he received and he was placed in a home at Mount Lofty, Toowoomba where he stayed until his death.